I liked the facebook page. 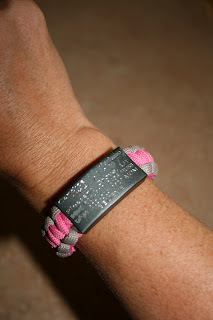 And I would want the pink paracord IDmeBAND, because I never run with a phone or my wallet. So if I was lying in a ditch somewhere, a road ID would be super helpful. I like the paracord bracelet like you have! I'd get a pink one like you have! Oh yeah, congrats on your long run and good luck at St. George! I posted the giveawy on my blog. I think I would get the plain black bracelet! These bracelets look awesome! I like the pink paracord one that you have! I put this up on my blog! I LOVE the Paracord! That is a fabulous idea. I like the pink or maybe even the black! I like Gone for a RUN on FB too! So glad to hear your LR went well. Nice job at tackling 22! That is just awesome. I liked gone for a run on fb. I really really like the one that you have and I also love the shoe idea. I would get a pink one you have because I love all things pink. I like gone for a run! I would chose the LE-IDmeBAND because it looks totally cool! I'm following your blog (love the onetri.com link!) and have shared this giveaway on FB. I've liked Gone for a run on FB for a long time lol, and have been wanting one of these in pink for a while. Running with ID can really save your life! I am torn between the pink and black.. everything I own is black, its so hard to stray away... I guess I choose...pink! And I just Tweeted it! I would pick the pink one just like yours! I'm a new follower! Saw a link to your blog on FB. Glad I'm here!!! - like the paracord for sure! ohhh i love the pink paracord or the purple silicone! Gone for a Run has a ton of cool stuff! If I had to pick one thing, I do like the idea of that paracord bracelet. Black is cool! I really like the blue paracord bracelet! I like the LE- IDmeBAND Engraved Paracord Safety Bracelet - Black one from the website. I'd use it to have protection should something happen to me on a run. I liked Gone for a Run on Facebook as well. I'd get the black paracord one because it matches everything. I always run with ID when outside - always! I'm following you! I'm doing 5 Days of Giveaways on my blog this week if you want to stop by! I really like the shoe ID but the pink bracelet just like yours is my favorite! I visited their site and would like the pink paracord ID. It's cute and just seems like a good idea. I love that it has emergency contact info and that the cord can be so useful in other ways, too. I get the IDmeBand pink paracord too. Why? Because in my crazy imaginary world, I might be lost in the wildness (during an ultra) and forced to use all those survival skills I have amassed while watching years of discovery channel shows. That paracord would come in handy! I might use it to build a shelter or snare some food. I like Gone for a Run on FB. I'd get the black "wrist band" because I'm a guy and we don't use the word bracelet :). I like the paracord pink one. It would be great to be wearing a bracelet that had all your info on it. Better safe than sorry. I follow you and enjoy reading your blog! Thanks for the giveaway opportunity :) I'd happily wear any color/style because i'd be soooo appreciative to win one. Thanks for letting me enjoy your great blog and inspirations :) Keep on bloggin'! I would wear the pink one. I would love it, because I never have anywhere to keep identification when running. I like the black bracelet! I liked GFAR on FB.